Today on Day 24 of my 31 Days of Nostalgia Series, I am pulling out a couple of vintage battery operated vehicles from my childhood home. These were before remote control! 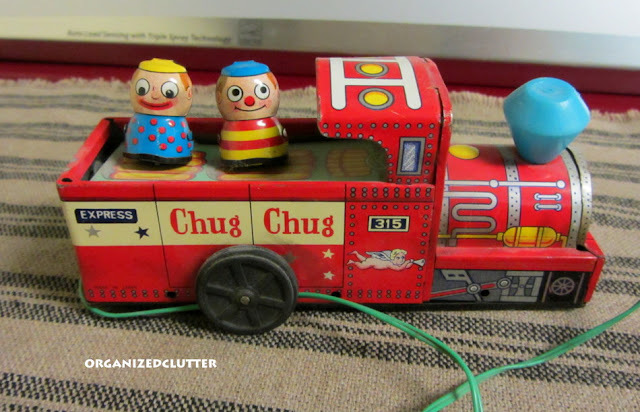 Here is the Marx Chug Chug Express, an all metal battery operated train engine with two delightful little vintage passengers. 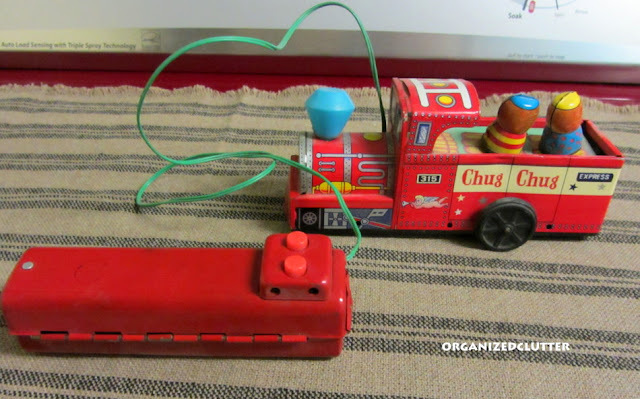 When the batteries are installed in the red controller, one button controls the engine forward and one backwards, but you must follow along as the green cord is not too long. It's in "played with" condition, but a fun collectible. 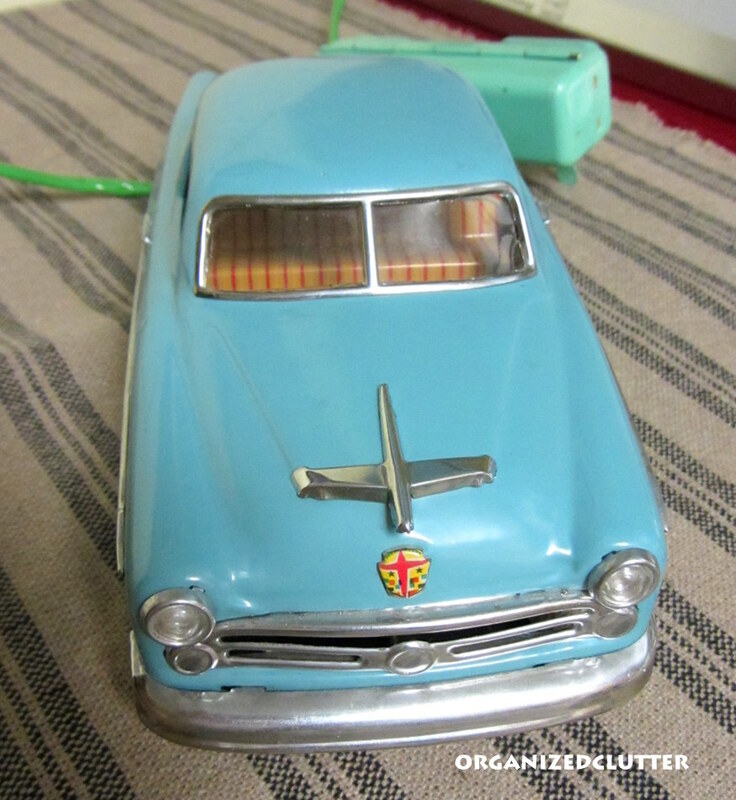 Speaking of fun, how about this battery operated vintage car from Marusan Kosuge, Japan? I think it would be fun to have the life size version of this vehicle to cruise around in. This car is in excellent condition. Not really "played with". I hope you are enjoying my "Nostalgia Series"! I am enjoying sharing my collections. Just look at those wonderful old toys. I can remember when everything was battery operated...I am feeling very old right now! 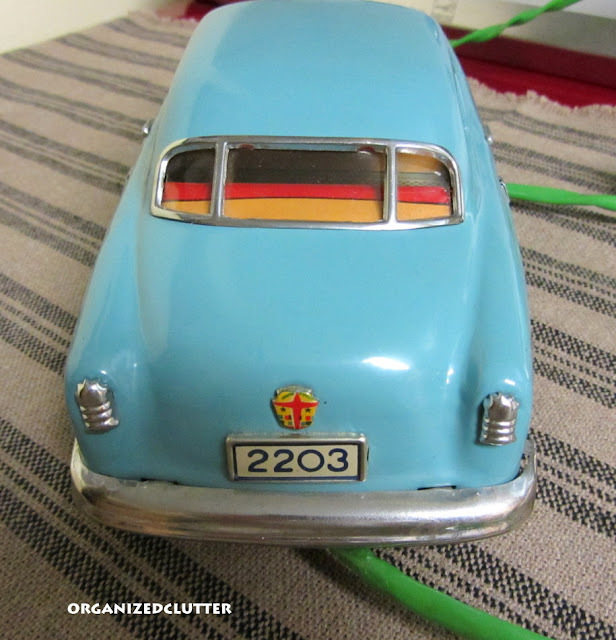 Your little red train and turquoise sedan are a delight and such special treasures. Thank you for you kind comment on my blog, Carlene. Those are neat. That blue car has a great shape to it. I'm sure you're not old enough for those to be from your childhood home though! 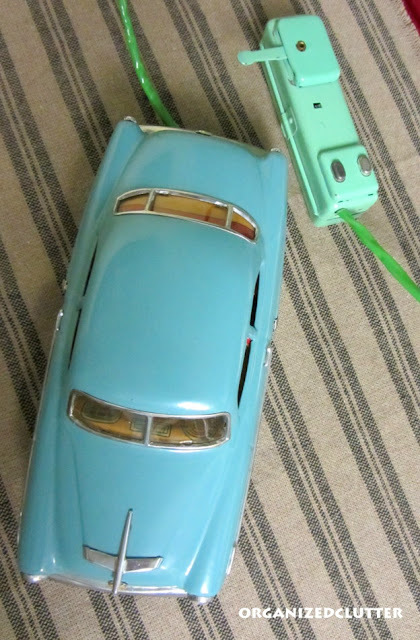 Sweet memories of your toys...I only have two, nostalgic possessions that were once mine. My Madame Alexander Doll I keep on display and an old tiger. No batteries included w/them! Thank you for stopping by w/a comment on my fall mantle. We never had any of these that I remember, but I bet they were quite the treasure in their day as I'm sure they are now to you as well. I can just imagine a little kid following it around having a blast! I love all your wonderful old toys! 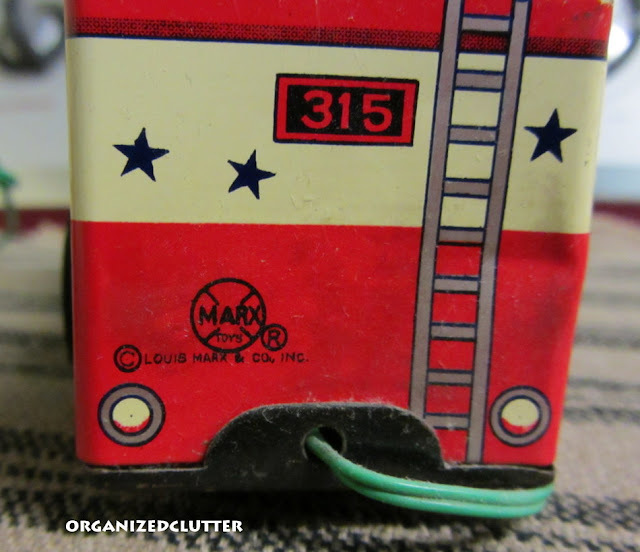 Wish I would have saved a few old things from my childhood! Good old toys are hard to come across now. These are very cool! I don't remember these but I like them! Love both Carlene!I have a collection of old toys. That car is too cool. The color is grand! Fun series. Thanks for sharing with SYC. 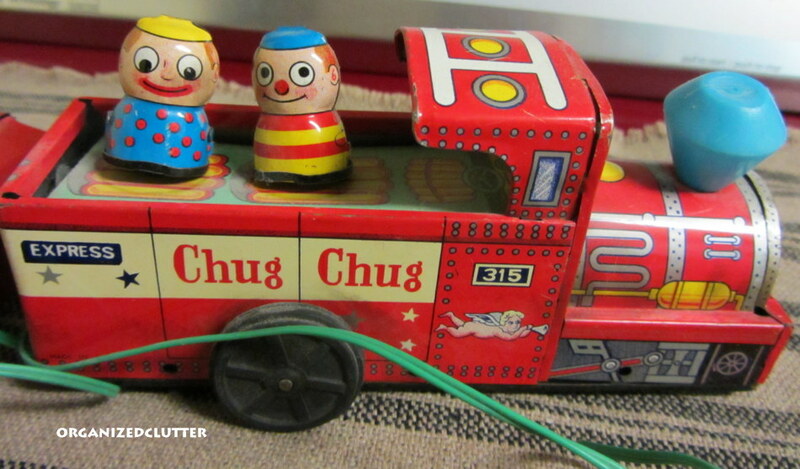 What wonderful battery operated toys. I love antiques, great finds! What a fun collection of cuties. Love the aqua car!